Vladimir Putin asked a student to pinch him after a young man from Nigeria said he couldn’t believe that the Russian president was really standing in front of him, during an informal meeting at the 19th World Festival of Youth and Students in Sochi. 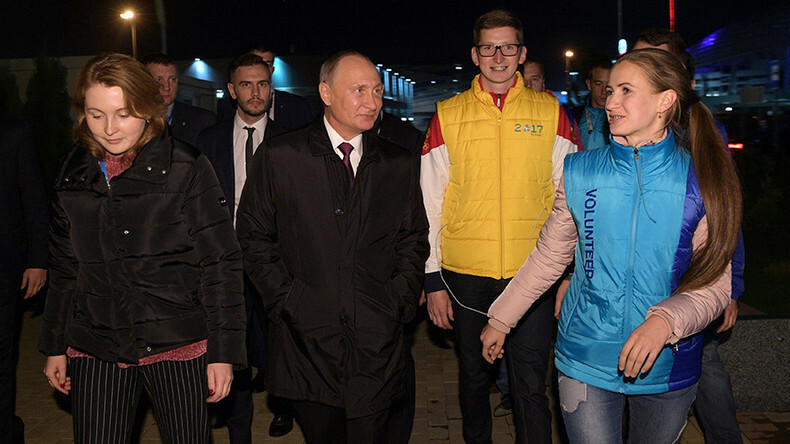 Putin’s arrival at the Olympic Park in the Russian Black Sea resort of Sochi late on Thursday came as a surprise for guests at the festival. “I'm so overwhelmed. I can't believe I'm standing in front of the Russian president,” the awestruck Nigerian student, Edostrey, said. Edostrey appeared reluctant to accept the offer, with the Russian president instead pinching the student himself, much to the amusement of the assembled crowd. The festival guests had plenty of questions for the Russian leader, with one student asking Putin to remember the most remarkable event from his youth. Another student wanted to know if the head of state was eager to take a pause in his busy schedule and join “the youth hangout” at the festival. “Of course, I’d love to,” Putin laughed, while making clear that it wouldn’t be possible. The visitors of the festival told the president they were talking about “ideas for a better world” in Sochi. “We talk about understanding each other better and how to deal with power, how to make each other accountable," one of the participants said, with Putin jokingly commenting that "power should be cared for, right?" The head of state received gifts from students from Tanzania, Mozambique and Serbia among other countries, and said that he enjoyed his time at the festival. “But the main thing is that you like it. We’re doing this for you," Putin told the students. Sochi is hosting the 19th World Festival of Youth and Students until October 22. During his speech at the opening ceremony on Sunday, President Putin said that the 2017 event will gather 30,000 people, making it the most representative in history. 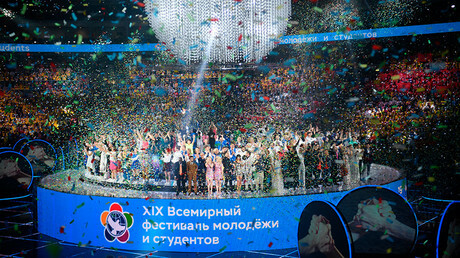 The festival, organized by the World Federation of Democratic Youth (WFDY) along with the International Union of Students since 1947, is being held in Russia for the third time after being staged in Moscow in 1957 and 1985.